All posts tagged with "what is a blog post? just a miserable pile of tags"
My quest for the last several months to improve the visibility of information that players care about through our UI has been a really interesting process. There’s a lot going on under the hood of Clockwork Empires, and we simply didn’t have the tools to show it to you before. But our UI has been getting steadily better at presenting data (and I’ve become less and less terrible at UI design) so I keep getting cool opportunities to show you what you actually want to see when you’re looking at various parts of the game. At this point I think there’s only one system that we haven’t shown at all but is pretty central to the way the game functions, and we actually had to avoid taking advantage of it because if we couldn’t show it to you, it got confusing. But now we can! And this system is tags. Every object in the game has a set of tags (attributes, if you will) that are generated when we first create an item, and can change over time as an object interacts with the world. Tags such as “timber” or “food” are straightforward examples. The common log. 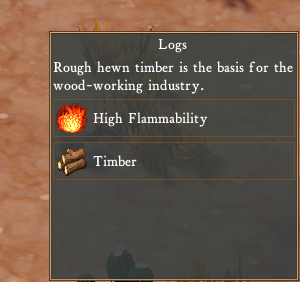 Flammable, timber, what more could anyone ask for in a log? Perhaps for a message, but only if you’re ready to listen.